The game that sold 70 million Wiis. You've probably already heard about Wii Sports. If you're not into video games, then you probably heard the media, getting it wrong as they always do, referring to it as the Wii itself, not making a distinction between the game and the system that comes with it (but being bundled with the system doesn't help). If you are into video games, you of course already knew about it. And no matter who you are, you've probably already played it. But for those of you who haven't, here's a rundown. Wii Sports is a game that comes with the Wii itself in every region of the world except its native country of Japan. It's five simplified sports in one game, and it's dependent on the Wii's motion sensitive remote-shaped controller. Baseball allows you to swing the remote like a bat to swing at the ball, or make a throwing motion of sorts to pitch. Fielding is controlled automatically. This is for one to two players. Tennis lets you swing the remote like a racket to hit the ball in a doubles match. You control the swings of your players as they automatically chase the ball. Supports one to four players. Single-player mode has you play both halves of the doubles team; two-player allows competitive or cooperative. Bowling lets you bowl by making a throwing motion, even going so far as to simulate the tendency to let the ball slip left or right due to an imperfect or not-quite-straight throw. The slightest twist of your wrist affects ball movement. Supports one to four players, even if you only have one remote. Golf is only a handful of holes. You hold a button while swinging the remote to swing the club and hit the ball. (If you swing the club without holding the button, you get a practice swing.) Supports one to four players, even with only one remote. Boxing uses both the remote and the nunchuck attachment, which plugs into the remote, to simulate punching with both fists. You can dodge by moving the fists left or right. Can be played with one or two players. Each of these games has three different practice games with various relations to the actual sports; the second and third of each sport are unlocked if you play the practice game before it. And there is a "Fitness Test". While Wii Sports is looked down upon by certain fanboys for its lack of depth (but for something like this, you don't need a plot), but for the motion sensing features of the controller and what it has done for video games, it has caused a big ripple effect that's still being felt today. Its easy-to-understand, pick-up-and-play nature has allowed people who don't play video games to get into it. Retirement centers are buying Wiis for the elderly to use, and use them they do. It's become the one video game that can be easily demonstrated to someone else when they ask you "why do you play video games? What makes them so fun?" Of course, by demonstrating a simplistic sports game, you're failing to capture the appeal of more complicated games like The Legend of Zelda. But, much like Sailor Moon was the "gateway drug" for anime fans, Wii Sports is the same for video games. Not surprisingly, Wii Sports also has the secondary effect of being associated with the Wii itself. Whenever elderly talk about "the Wii", they only mean "Wii Sports". They don't mean Excite Truck, Super Mario Galaxy, or even Super Smash Bros. Brawl. The Wii has become synonymous with Wii Sports, and the general, non game-playing public won't bother to correct this mistake. Slightly more savvy players will likely simply refer to each game in the package as "Wii (insert sport here)". 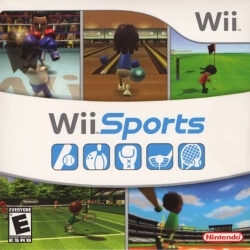 The game seems to have spawned a series of games that is typically referred to as the "Wii series", games that are all named Wii "(insert something here)", that focus primarily on using Miis to play games, such as Wii Play, Wii Music, Wii Fit, Wii Party and a true sequel, Wii Sports Resort that uses the newly introduced Wii Motion Plus accessory for more advanced control. Wii Fit, Wii Sports Resort, and Pilotwings Resort all feature Wuhu Island as their main setting. AI Breaker: The AI in boxing simply can't deal with repeated dodging+only using counter attacks. It is possible to get your rating off the scale, then off the TV with this. Casual Video Game: Arguably, one of the prime examples of this. Divorced Installment: There were plans to make this a Mario sports game, but players took a liking to their Miis, so it became what we have today. And then a Mario-themed sports compilation game was made anyway. Follow the Leader: Plenty of third party games tried to cash in on this. Now we have Sports Champions for the Playstation Move, and Kinect Sports for the Kinect. Luck-Based Mission: Baseball. When the opposing team hits the ball to one of your fielders, there is absolutely nothing you can do regarding whether he fields the ball cleanly or makes an error. And as is the case with real baseball, one poorly timed defensive mistake can change the entire course of a game. Off the Chart: Getting a high enough ranking (easier in boxing with AI breakers) will result in this. To show it isn't intentional, keeping it up will put you off the TV. Powerpuff Girl Hands: Despite these, the Miis can still participate in a number of sports that require them to hold things, from tennis to bowling. Retraux: At times, the soundtrack sounds like synth music from The Eighties. This was not lost on people. ↑ Of course, despite being available as a stand-alone title on store shelves, this has a lot to do with it being bundled with almost every Wii (subsequent runs have been bundled with other games instead, such as Mario Kart Wii), so nearly every Wii owner gets the game anyway, whether they even play it or not. This page was last edited on 10 April 2017, at 06:29.